Giovanni Martinelli is for me the greatest tenor of the recorded era: what I wouldn’t give to have heard live, his performances of Otello or Il Trovatore. Luckily he was quite well recorded, albeit not always in the best quality (his best recordings were made between about 1915 and 1941 so that is not so surprising), but they do none-the-less capture the excitement and quality of the voice. A short biography of Martinelli can be found below, whilst reviews and opinions can be found here, Reviews. 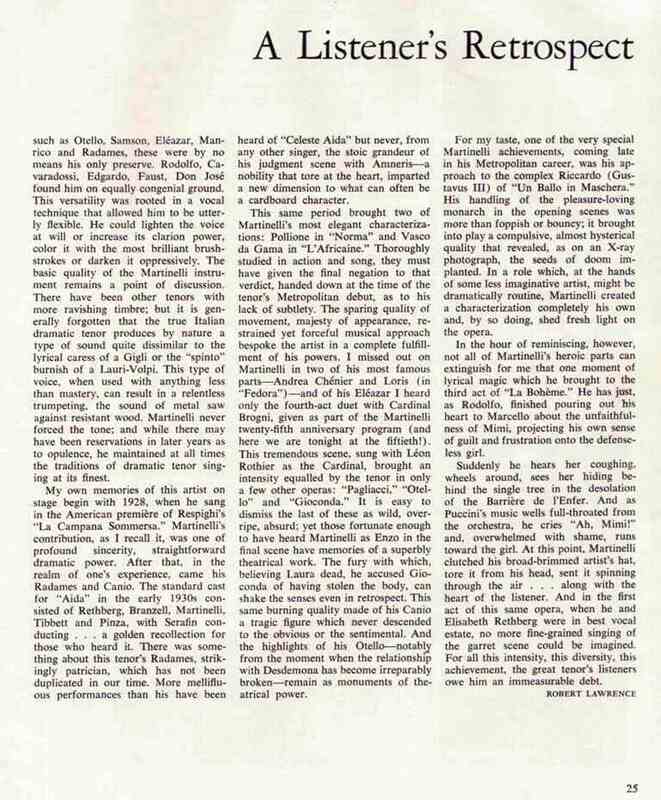 For this biography I quote extensively from the book accompanying a 3 LP set of Martinelli that I was lucky enough to purchase in a second hand LP shop in New York titled 'Giovanni Martinelli: In Memoria'. The article in the boxed set is called, 'Giovanni Martinelli, The Last of the Titans', and is written by Edward J. Smith. 'Martinelli had to give 20% of his earnings to these sponsors for a score of years and this sum eventually won for these people a sum of money close to $1,000,000. Two years prior to this, and before he had actually started his studies, the city of Montagnana put on a dozen performances of Aida in the months of September and October, 1908. The Radames was Giovanni Vals, a 36 year old tenor and one of the fine artists in Italy. Martinelli was asked if he would want to sing the Messenger in the performances. Eagerly he accepted and sang all 12 performances, receiving three lire a performance (60 cents). But for that enormous sum he also had to sing in the chorus when his part of the messenger was finished. "One did not earn three lire easily in those days," the Maestro would relate. Vals was impressed with the young man and told him, "Continue as you are going and in three years you will be singing Radames". The first real public appearance by Martinelli was at a performance of Rossini's Stabat Mater on December 3rd, 1910. His colleagues included Vittorio Arimondi, Virginia Guerrini and Celestina Boninsegna. Martinelli says that from a superstitious standpoint, he felt very good about the presence of Boninsegna, not only because she was the foremost Italian dramatic soprano of the day, but because of her name. Split the name in two - Bonin - and - segna - meaning good sign. A good sign it was for the young tenor received excellent notices, especially for the sustained high D-flat in the Cujis Aninam. On December 29, 1910, the official debut in opera came with a performance of Ernani. Mandolini was in the prompter's box, and as Martinelli recalled the vent all he could remember was Mandolini's distorted face screaming at him, "You idiot - you are forgetting again - I will kill you!" - Musically it may not have gone so well, but the solidity of the voice and the brilliance of the upper register brought the audience to its feet and success was insured. Following the Ernani success, the young man was engaged in Ancona, Brescia, Genoa and Turin. 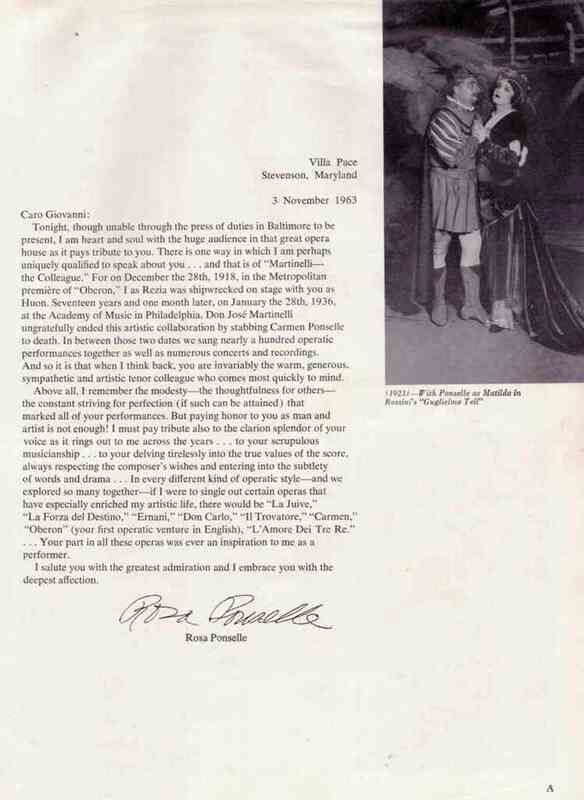 On his return from singing Ballo in Maschera in that city, his sponsors told him he was to sing an audition for Casa Ricordi, the most powerful of all European publishing houses. The tenor entered upon the stage of a darkened auditorium. Out of the depths a voice demended, "What will you sing for us?" Giovanni started with his two warhorses - Cielo e mar and Celeste Aida and finished with E lucevan le stelle from Tosca. The lights went on and three men climbed upon the stage. The first was Guilio Ricordi - but when Martinelli saw the other two his knees buckled, and he had to hold to the piano for support. "All the world knew these two," he related, "The first was Arturo Toscanini and the second was Giacomo Puccini. Toscanini kept stroking his moustaches. "Yes," he muttered, "He will do," "He will do very well," echoed Puccini. "Alright young man. We will take you." - Take me? "Take me for what?" pleaded the stunned young tenor. The composer and conductor laughed. Then he was told. Puccini's latest opera, Fanciulla del West, had premiered two months ago at the Metropolitan Opera House with Enrico Caruso. Now the Roma permiere - also the European premiere was to be given. Amedo Bassi had been engaged to take Caruso's place but Bassi had engagements at Covent Garden. He could sing but one performance. Another tenor was needed when Bassi departed. That tenor was to be Giovanni Martinelli. Martinelli set to work at once - but the then strange harmonies of Puccini with the almost tonal school and musical jumps so different from the bel canto school in which he had been trained puzzled the singer. After a month of study he was called upon to sing an audition for Toscanini. The great conductor listened with growing impatience - "No, No, No!" he shouted, "You will not do. You are too much of a recruit for me. I must have someone who knows - No - go back home ..." The heart of Martinelli sank in his chest. Summoning a smile, he replied wanly, "Si Maestro..you are right...I am not ready..but at least I go home with two great things accomplished." "What is that?" demanded Toscanini. "I have been to Roma, and I have had an hours work with Arturo Toscanini ." The maestro's scowl vanished and a smile creased his face. "Martinelli, you are a 'sympatico giovine'", he declared. "We will work together. You are not the idiot I suspected." 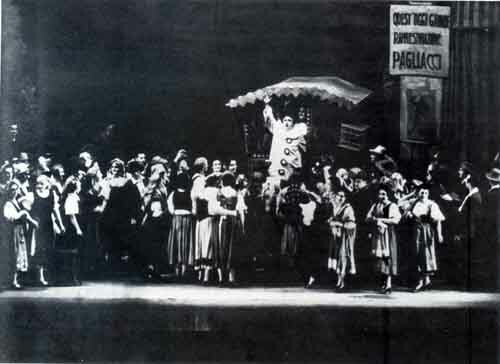 Soon under Toscanini's direction, the musically trained Martinelli grasped what was wanted and after the first performance he replaced Bassi in the world premiere performances of Fancuilla. "Toscanini even allowed me a bis after Ch'ella mi creda", Martinelli told with immense pride. With his compatriots Eugenia Burzio and Pasquale Amato, the young man made musical history at the Costanzi Theatre. All of Europe's most famous maestri were at the performances - and Martinelli was heard not just by famous conductors but equally famous theatre directors. Engagements in Monte Carlo, Brussels and Budapest followed. 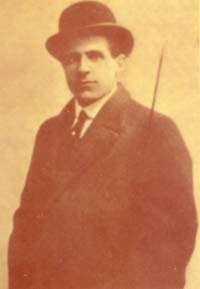 Cleofonte Campanini, director of the opera at Covent Garden, also heard him, and in the spring of 1912, Giovanni Martinelli, age 27, set out for London. His debut took place April 22, 1912 in Tosca, and Herman Klein, foremost of the living British critics declared, "He has that rare gift - a true tenor voice. It remains the finest tenor heard in England for years. Its quality is luscious, ringing, musical and delightful to hear. The moment he had finished Recondita armonia, the house rose at him." All in all, over five seasons - 1912, 1913, 1914, 1919 and 1937, Martinelli sang over 90 performances of fifteen operas at Covent Garden. These included Aida, Fanciulla del West, Gioelli della Madonna, Manot Lescaut, Tosca, Dubarry, Butterfly, Pagliacci, Ballo in Maschera, Boheme, Francesca da Rimini, Faust, Carmen, Turandot and Otello. 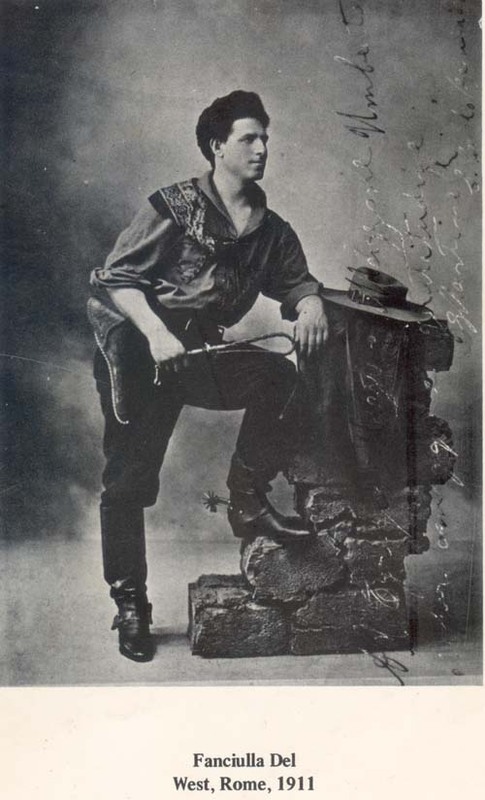 After Covent Garden in 1912, Martinelli returned to Italy where he created Marzio in Zandonai's Melenis in Milano and followed this with his La Scala debut in Fanciulla with Galeffi and Poli-Randaccio. Prior to this he had sung over 20 performances of Manot Lescaut at the Dal Verme in Milano with Claudia Muzio. When time came to put on the Fanciulla, La Scala intended to engage Bernardo de Muro (shown left), a splendid dramatic tenor, four years Martinelli’s senior. The management did not want a young man who had been singing at a rival but lesser theatre. Puccini put a stop to this. He wired the La Scala management. “Martinelli sings Johnson or you do not do Fanciulla”. Martinelli sang Johnson. 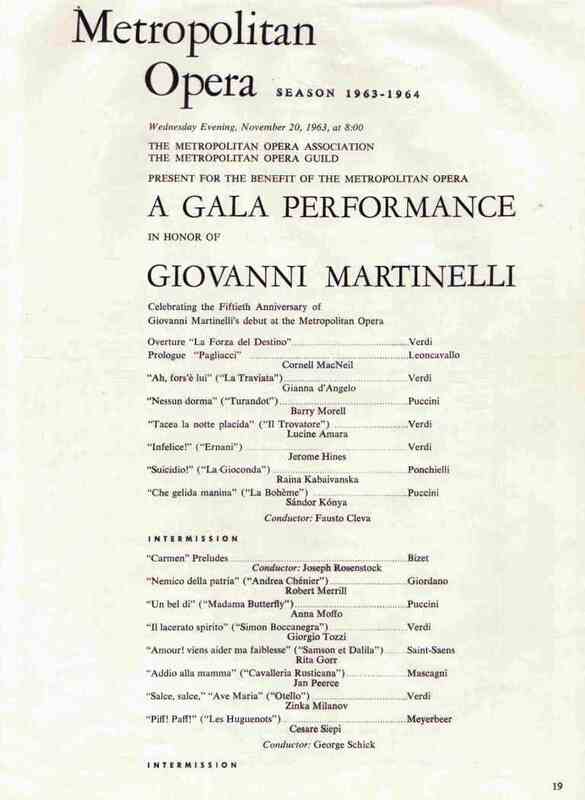 Martinelli recalled at this time being present in Puccini’s suite when Toscanini was making suggestions for certain musical changes he felt would help the opera. Puccini, lying on his back on the bed, listened with growing irritation. “Basta”, he said, “If the Girl was born with Gambi storti”, lascia cosi…”If Fanciulla was born with twisted legs, it’s too bad. Leave her alone”. Toscanini argued no more. On August 7 th, 1913, the up and coming young tenor married Adele Prevatali of Roma. This marriage which produced three children passed its 55th anniversary in August 1968. 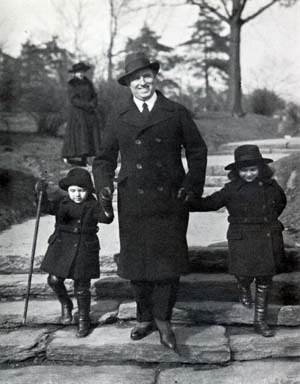 Following the recommendations of Toscanini and Clefonte Campanini who was conducting the Philadephia-Chicago Company, Giulio Gatti-Casazza engaged Martinelli for the Metropolitan for the fall of 1913. The young tenor arrived by boat with his young bride in late October. Not knowing what to expect, Gatti ‘loaned’ Martinelli to the Philadephia-Chicago Company for its opening performance of Tosca in Philadephia. 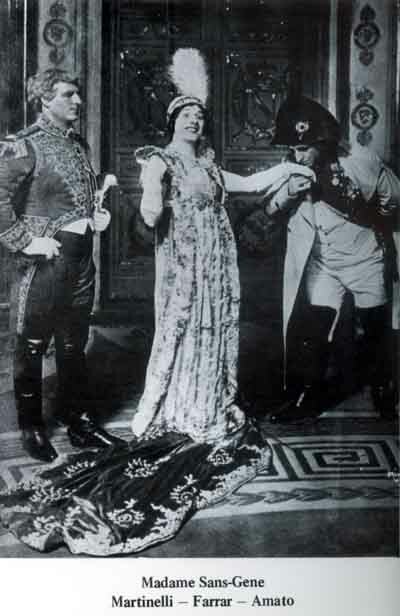 Martinelli sang with Mary Garden and Vanni-Marcoux as Scarpia. Garden sang the opera in a mixture of Italian and French – but mostly in French. Listening in the wings, Martinelli was astounded to hear Garden snarl out the words – “E avanti a lui, tremava tutta Roma”, and then dropping a crucifix on Scarpia’s chest, she turned to the audience and declared “Viola, C’est fait”… and then made her exit. 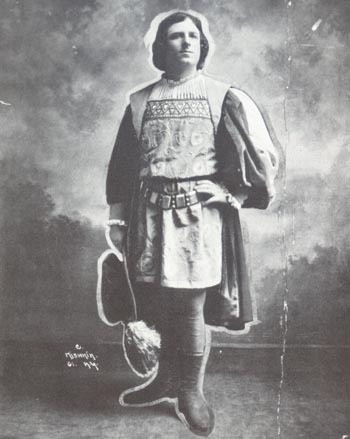 On November 20 th, 1913, with Antonio Scotti and Lucrezia Bori in his cast, Giovanni Martinelli sang the first of 26 Bohemes he was to sing at the Metropoltan. He was recognised immediately as one of the finest tenors to have joined the Metropolitan since Caruso and within the first season, he as declared by Caruso to be his ‘Crown Prince’. Martinelli had sung with Caruso at Covent Garden and he worshipped his older colleague. The costume is preserved in the Martinelli home. It has never been worn. “I could not desecrate it by wearing it, “Martinelli explained simply. 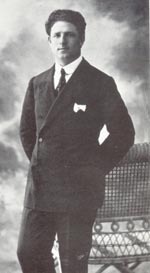 In 1916, then recognised as second only to Caruso among the tenors of the world, Martinelli went to Beunos Aires to sing. He appeared in Boheme, Aida, Faust, Tosca, Ballo in Maschera, Trovatore and Hugenots. Following this first performance of the Meyerbeer opera he returned to his dressing room and found a distinguished looking old man waiting to see him. In excellent French-accented-Italian this man escused himself, and then said, “Young man, you sang magnificently. But here were certain things you did in the duet finale ‘Dillo ancor’ in Italian, which I do not think were right. May I show you the proper phrasing?” “Of course,” replied Martinelli. The man seated himself at the dressing room piano and proceeded to demonstrate. “I was a pupil at the Paris Conservatoire when Meyerbeer used these phrases to illustrate certain legato effects, “he said. “He wanted them done this way – .” Martinelli was amazed and tried the attacks to the high C flats as directed. They came out much easier and flowed instead of being difficult to attack. The tenor proceeded to thank his coach profusely and the man started to leave. “But what is your name,” demanded Martinelli, “The old man smiled, “Camille Saint Saens,” he said. In late 1921, Martinelli visited Puccini at the composer’s home at Torre del Lago. Puccini was working on his final opera, Turandot. He called Martinelli into the music room. “Sing this, Giovanni”, he said and handed the tenor a piece of manuscript music he had just finished. Martinelli picked it up, and reading at sight began, ‘Nessun Dorma’ – When he finished Puccini demanded an encore in full voice. Highly pleased the composer said, “The opera should be ready by 1923 and I want you for my Calaf. I will tell Toscanini you are to create this for me.” But cancer of the throat slowed the composer’s work and in November 9124 Puccini died without having completed the opera. When the work was finished by Alfano the world premiere was set for 1926. Again Toscanini summoned Martinelli, who pleaded in vain against the stone wall determination of Gatti-Casazza. “I do not stop you going,” he was told, “Only if you go do not return.” Once again Martinelli was thwarted. It had been thought that Giacomo Lauri-Volpi might substitute for Martinelli, but Gatti also refused him permission to go. Pertile was engaged outside of Italy in contracts which could not be broken, so Toscanini was forced to use Miguel Fleta, a splendid Spanish Lyric tenor, but one obviously unsuited for the dramatic demands of the Calaf. 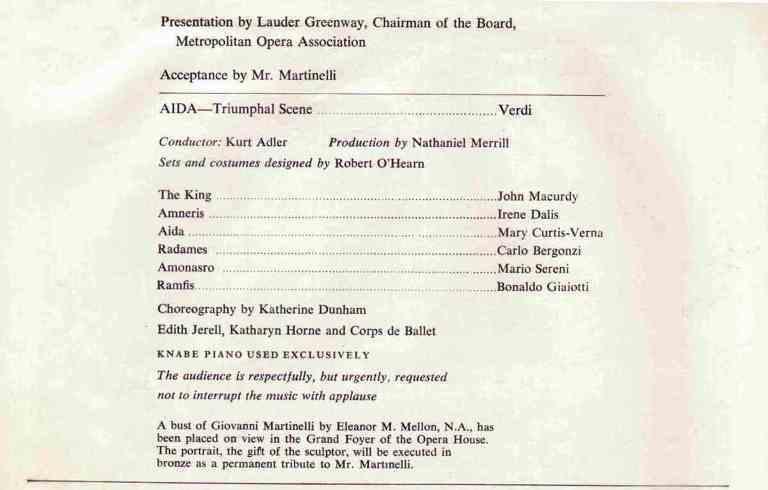 When, in 1927, the opera was brought to the U.S. Martinelli refused Gatti’s offer to sing it at the Metropolitan, and Lauri-Volpi was the one to create the part for America. 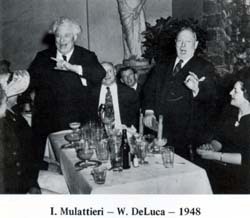 Martinelli did not sing Turandot until 1937, when he sang performances with Eva Turner at Covent Garden. 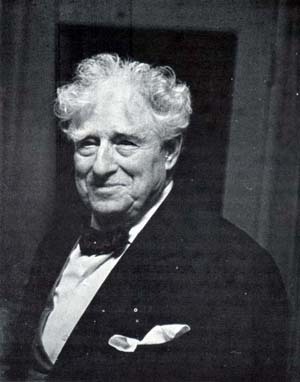 Both at the Metropolitan, at San Francisco and at Chicago, Martinelli was acclaimed as having no equal in his own repertoire. At that time – 1917-1921, old timers will say that there was no difference in the public demand for tickets for Martinelli or those for Caruso. In some operas, such as Faust and Trovatore, Martinelli ranked alone. 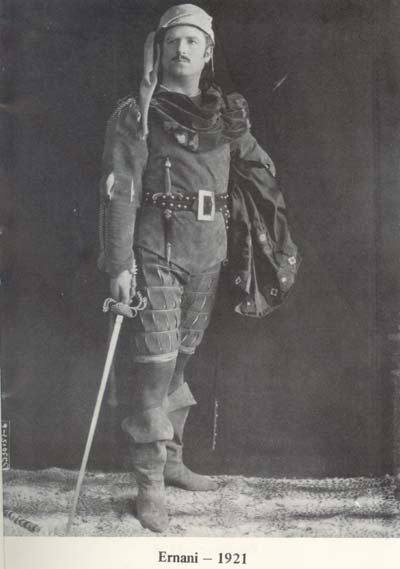 Caruso’s extreme top had become a bit jagged and he had difficulty with a sustained high B. Caruso did not sing Travatore at the Metropolitan after 1907, and the revival of 1914 of the opera featured Martinelli. The story of those rehearsals is told later. 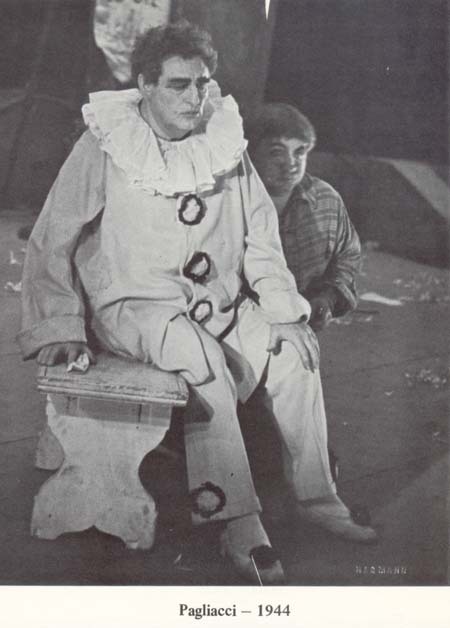 After visiting Rio de Janiero in 1921, Martinelli helped form the San Francisco Opera Company in 1922, when under the baton of Gaetano Merola, he sang performances of Faust, Pagliacci and Carmen at Stanford University. The following year the opera company shifted to San Francisco and through 1939, Martinelli sang in the following operas in the coast city: Andrea Chenier, Travatore, Pagliacci, Aida, Forza del Destino, Otello, Juive, Boheme, Samson, Norma, Carmen, Ballo in Maschera and Tosca. 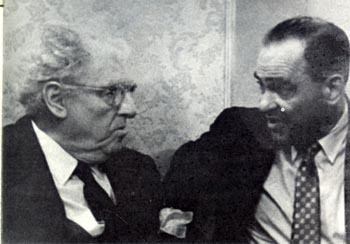 "Umberto Giordano was associated with me, or I with him, as the case may be, throughout most of my career. In 1915 I first met him at the rehearsals of Madame Sans-Gene at the Metropolitan where I assisted in the world premiere with Farrar and Amato. Again in 1922 I met him at the rehearsals of Fedora which we did with Jeritza and then, lastly, at the performances of his most famous opera, Andrea Chenier. I had not heard Chenier before I attanded some of the performances at the Metrpolitan with Muzio, Danise and Gigli. Later on, De Luca and Ruffo took Gerard, Ponselle and Rethberg the part of Madeleine and Lauri-Volpi and I sang the title role. I first heard Gigli and I left the theatre thoroughly downcast. 'Martinelli', I said to myself, 'How will you ever get the nerve to stand on that stage and sing Andrea Chenier after that glorious flood of sound you've just heard from Gigli.?' I voiced these doubts to Giordano who put his arms around my shoulder and said, 'Look , Giovanni, Gigli's voice is the most beautiful lyric tenor in the world today. If you tried to sing the same way, I'd say no. But you are gifted with a far more heroic voice. Chenier can be a dreamy poet, but he can also be a heroic figure. Make him that, and you will succeed. Here, let me emphasize how much verismo there is in this, the first of Giordano's aopera, written in 1896. Starting with the baritone soliquoy, Son sessant' anni through the Un di all'azzuro spazio of the tenor and continuing with such solos as Si fui soldato, La Mama morta of the soprano, Nemico della partria and Vecchia Madelon, the opera is built on dramatic recitative. Only in the lyric line of Come un bel di di Maggio and in the last part of the duet finale Vicino a te, does Giordano allow the lyric line to creep into his score. But I return to the composer and what he told me. I took heart and sang as I imaginmed a soldier would sing and the public seemed to like this interpretation as well as that of the lyric poet. Let me tell you a funny episode involving my first preformance of Chenier which took place in the open air at Ravina Park, Chicago. I had reached a point about three-quarters through the famous Improviso in the first act when suddenly all the lights went out leaving the stage, orchestra and audience in total darkness. I stopped and so did everybody else. Hurriedly the electricians were summoned and after a brief intermission the lights were restored. Maestro Papi, who was conducting, whispered to me, "Giovanni, da capo." I began the aria gain and had arrived at virually the same place when the lights failed for a second time. After they had been fixed I looked at the pit hoping the maestro would have decided to continue the performance following the conclusion of the aria. No such luck. Once again, Papi signalled da capo. So I experienced the wildest possible success in my first Chenier, singing the Improviso three times. To this day I have been unable to decide whether it was audiences desire to hear the aria repeated which caused the lights to fail or whether some distant colleague 'put the horns on me'. 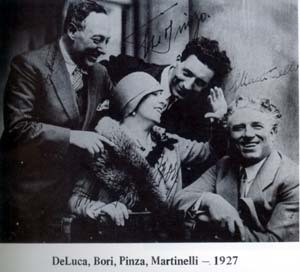 It is interesting to note that during their careers together (1913-1921) Martinelli and Caruso each sang Aida, Carmen, Pagliacci, Butterfly, Tosca, Boheme, Lucia, Manon Lescaut and Ballo in Maschera in the same seasons. Caruso also sang Prophete, Juive and Forza in the standard reportoire which Martinelli did not. 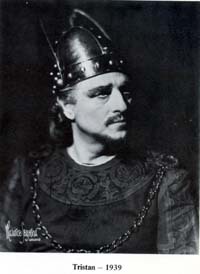 Martinelli however sang Faust, Travatore and Lucia which Caruso no longer sang. With the advent of Gigli, Martinelli continued to sing the same operas as before - but Gigli sang in Rigoletto, Traviata and Elisir dAmore which Martinelli did not. Gigli did not sing any dramatic parts at the Metropolitan until he came back at age 48 in 1938 when he did do two Aidas. 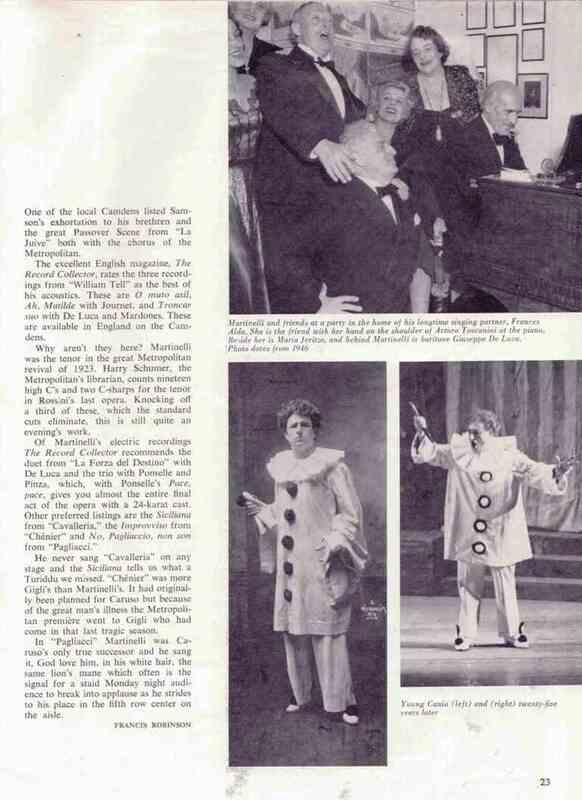 But he never sang Pagliacci, Travatore, Carmen or Ballo on the Metropolitan stage. 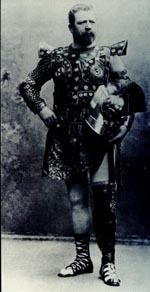 Martinelli sang more performances of leading parts than any other tenor in the history of the Metropolitan. He sang a total or 650 performances at the New York house and some 350 performances on tour with the Metropolitan. All in all, Martinelli estimated he sang a total of 4,500 operatic performances in his life. At the Metropolitan he sang 36 parts. His complete reportoire was a total of 62 parts and he was learning the 63rd at the time of his death. At the Metropolitan his record of performances are as follows: Aida ; Carmen ; Pagliacci ; Travatore ; Faust ; Butterfly ; Tosca ; Boheme ; Juive ; Otello ; Forza del Destino ; Lucia ; Lakme ; Madam Sans-Gene ; Samson et Dalila ; Simon Boccanegra ; Ernani ; L'Amore Dei Tre Re ; Manon Lescaut ; Gioelli della Madonna ; Don Carlos ; Francesca da Rimini ; Oberon ; Guglielino Tell ; Fedora ; Fanciulla del West ; Gioconda ; Zaza ; Eugene Onegin ; La Campana Sommersa ; Andrea Chenier ; Norma ; Goyescas ; Prophete ; Ballo in Maschera ; Africana . Martinelli's career in the 1920s and 1930s with few exceptions was limited to America. The tenor regretted this at a time when he had retired. "My management demanded so much for me, that other than in America, no one could afford my fee", he complained. 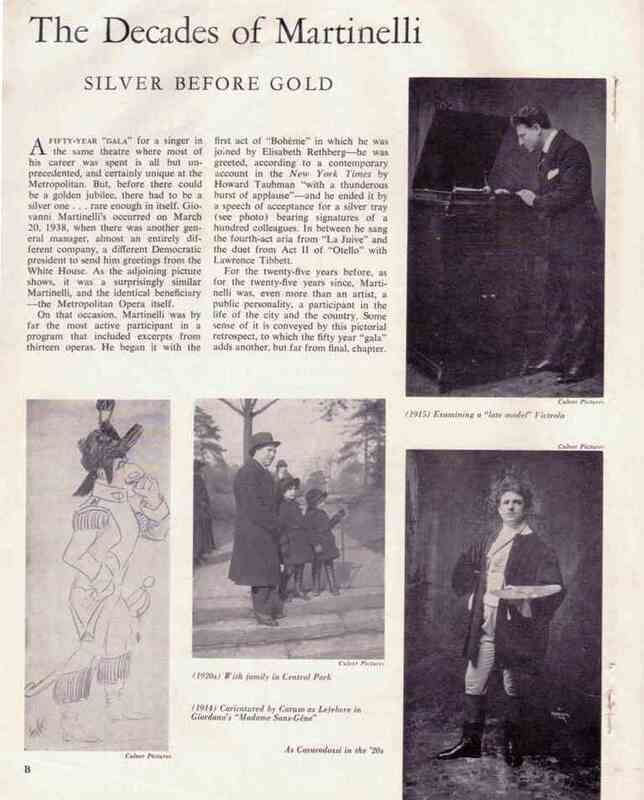 This was the reason for the 18 year lapse between 1919 and 1937 in his Covent Garden appearances. Gatti held him back from going to La Scala in Italy but he did sing in Roma in 1928-29 at the Constanzi, appearing in Chenier, Aida, Forza del Destino, and La Campagna Sommersa and also in Ernani, Chenier and Manot Lescaut at the Dal Verme in Milano. He last sang in Italy in Bari in 1934 (Aida). He was asked to sing Parsifal in 1940 at La Scala but the outbreak of the war ended that possibility. He sang in Paris in 1937 and in Rio de Janiero in 1942. Canada also heard him occassionally, but that was all for his international career. 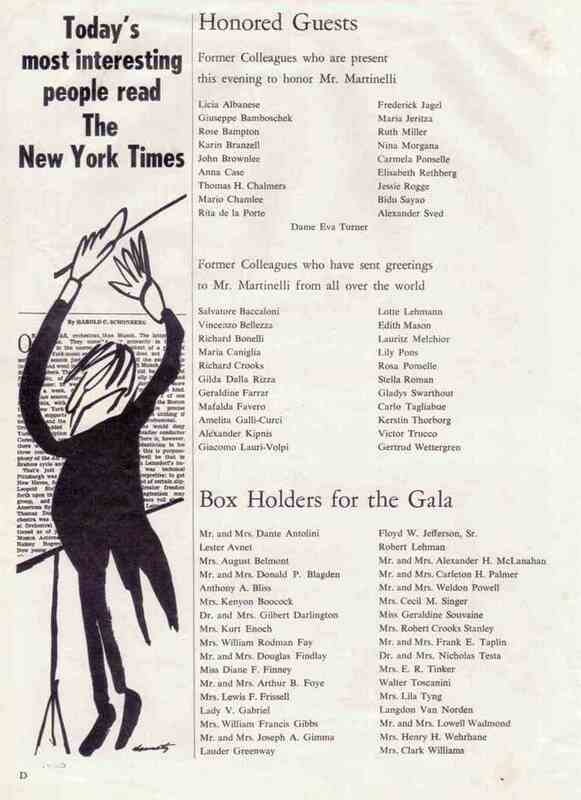 His final actual performance at the Metropoliltan was in Norma in 1945 but he closed his Metropolitan career with Act.III of Boheme with Licia Albanese and John Brownlee in an Italian benefit in 1946. His last peratic performance was Samson et Dalila on January 24th, 1950 in Philadephia. 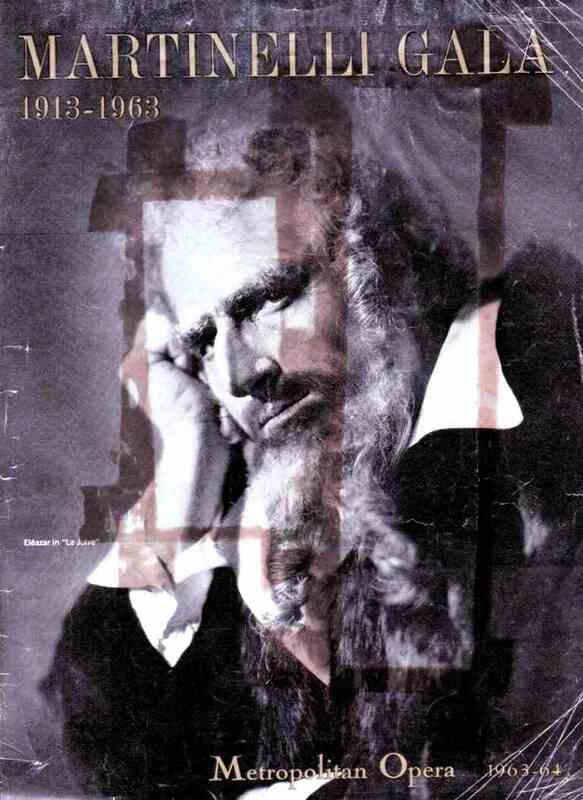 Late in his career, in 1939, he sang Tristan with Kirsten Flagstad in Chicago. 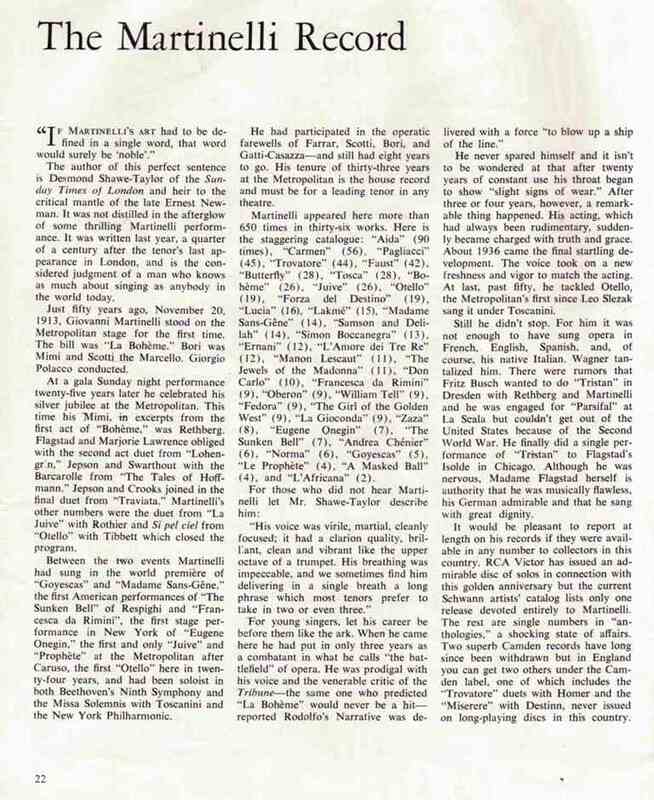 Flagstad told this writer [Edward J Smith] that the 54 year old tenor sang with a lyric line and a perfection of legato of German diction which overwhelmed her. "This", Flagstad said, "was one of the great emoptional experiences of my entire career. 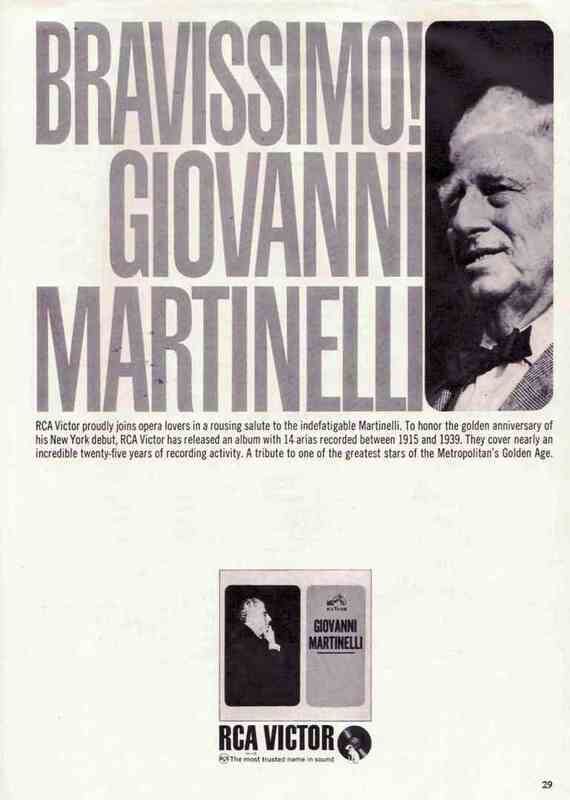 I wish I could have sung much more with Giovanni Martinelli. He was the acolleague of colleagues." Of the character of the tenor, I am perhaps in as good a position as anyone to judge, for in the past half century I have been witness to many episodes which showed him in his true light. Never, never, did I hear a harsh word of judgement passed on any colleague. He simply did not know how to speak evil of others. He only spoke when he could praise and one gathered if he had nothing to say, then he did not approve. He was a loving father to his two daughters and especially to his beloved Lele to whom he wrote faithfully every day. For the past score of years it was a ritual for me to carry his mail to him at 9.20a.m. every morning from Monday to Friday. On every one of those days, Giovanni Martinelli would be sitting up in bed drinking his morning coffee and writing to his beloved wife. Many were his old colleagues less fortunate financially then he, who on the Martinelli payroll. I remember one incident in Roma four years ago when he asked me to meet him at the Banco di Lavoro at 12 noon. I got there at 11.35 and Giovanni arrived at 11.45. He was angry when he saw me and told me to await him outside the bank. At that moment an old man aided by a cane came out of the bank. Martinelli groaned in disgust. "Eddie, you were not here today. Remember that", he said. We entered the bank and Martinelli drew out 500,000 lire (US$800) and gave it to the old man, who dropped to his knees and tried to kiss his hands. Martinelli, terribly embarrassed pulled away. He then introduced us - "This is Manfredo Polverosi", he said. Polverosi had been a slendid tenor who had sung much in Martinelli's company in Italy and who had recorded extensively for Fonotipia. He was then broke and destitute. This was but one of many aided by the great tenor. Martinelli was godfather to my son, Eddie Jr. Once, when Eddie was three, Giovanni came over for his weekly visit and was immediately surrounded by a group of adults who clamoured for his attention. Eddie, holding a toy, tugged at his sleeve. Giovanno looked down and said, "Just a minute Eddie" ... Eddie walked off muttering, "I guess he does not like that toy, I'll get him another one". Martinelli overheard and a funny expression covered his face. When Eddie returned with a set of trains - Martinelli swept the adults to one side, and got down on his knees to play with the trains. For five minutes the blonde head of the three year old and the white head of the 75 year old were together on the floor before Martinelli rose kissing his Godson. He would not and could not disappoint a child who thought that he was there only for him. I have sung with Giovanni since 1914", he said. "Let me tell you in his vocal prime his voice had a unique quality which was as individual as that of Caruso. It was golden in hue and so ingratiating in its warmth that it caressed the ear and that for a spinto is a remarkable thing. Martinelli's diction, his phrasing and especially his breathing were unique. I never heard any singer who had the enormous breath and line which Martinelli possessed. He would sing phrase after phrase in a limpid legato line which would leave the listener limp and gasping for breath. His high register was magnificent and thrilling. The voice was an enormous one to start with, with carrying quality which increased its volume the further back one sat in a theatre. Martinelli reached a C or even a D effortlessly and was able to sustain those notes with a brilliance which defied description. Above all he was an artist in everything he sang and he would deliberately make ugly sounds in his characterisations sucj as in Juive, because the personality he was creating would have done so. In his early days he was an ordinary actor. 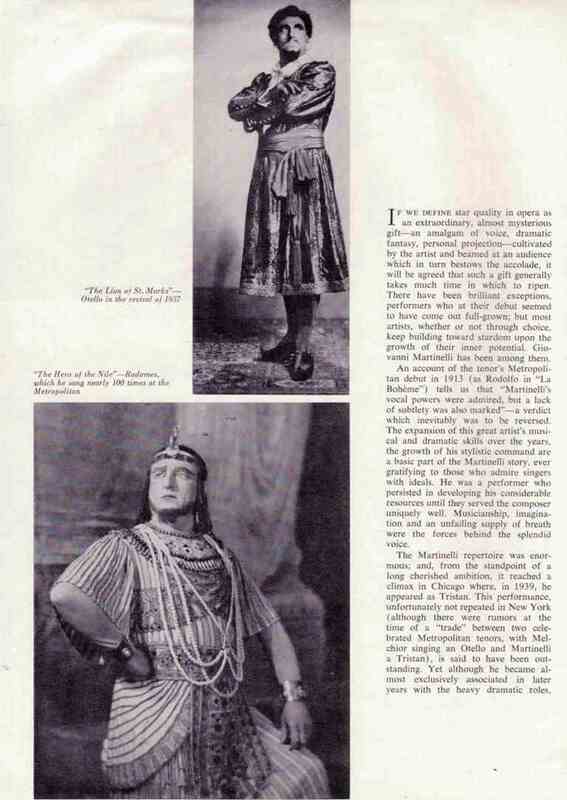 From 1930 on he was superb and his Otello, Pagliacci, Samson et Dalila would have been magnificent characterisations even if he just acted them. To me," said DeLuca in conclusion, "the word nobility best describes Martinelli's art. I would rank him as one of the three greatest tenors with whom I have been associated." The last years of Giovanni Martinelli's life were spent in lecturing with the aid of phonograph records of his own and his old colleagues. He spoke mostly on Verdi and on the composers he knew starting with Puccini. To this end he went several times to London as well as the west coast of the United States revisiting the cities where he has sung in past years. 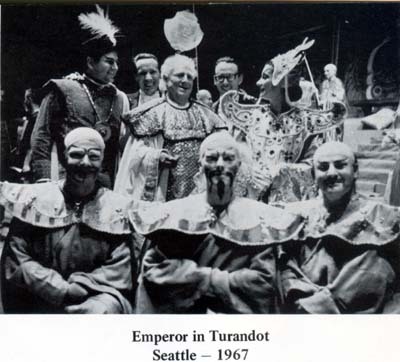 In 1967, while in Seattle, the illness of a member of the cast of Turandot, resulted in the tenor returning to the stage for the first time in 17 years. Martinelli sang the part of the Emporer, a part he knew well, since the Emporer always talks to Calaf, the young prince, the principal tenor part which Martinelli had sung in his younger years. The tenor agreed to do one performance but finally acceeded to the demands that he do all three - but he donated his fee to Italian Relief for the aid of Florence, then recovering from the overflow of the River Arno. More recently he was asked to accept the presidency of the London Opera Company (Michael Scott, managing director) and also has been asked to return to the stage this season once again in commemoration of his 60th anniversary on the operatic stage. He decided he could do Leoni's L'Oracolo, which he knew well since the opera usually preceeded the Pagliacci which he sang at the Metropolitan. He wanted to do the basso part since it offered better acting possibilities and was the part of an old man. He had started to work hard on the music, which was transposed up for him a minor third so it would lie well in the tenor key. He had just finished recording a solo for the use of the Edison Company in a commemorative album of his Edision records discussed with the executives of Edison, and he was prepared with films of himself and of his colleagues to tour once again to the west coast (as far a Seattle, San Francisco and Los Angeles) in which he would tell stories of his by-gone friends who silent and sound images would be flashed on the screen with his own. Martinelli was the first great artist to make sound films - his first having been made in 1926, a year before Al Jolson's The Jazz Singer. Martinelli made a total of 20 such films, some 13 of which have survived. Martinelli refused to grow old. His savage "Io non voglio invecchiare" was his credo and he lived life to the hilt. His vigour was incredible and as will be seen his discs, he retained an amazing amount of voice for a man past 80 - even the high notes were there, to and including a sustained high B. I heard him sing this in December while giving a lesson to a pupil. He tried not to go above the staff while recording or in singing because, as he said, he had the notes, but who knew what went on with the machinery inside. He had been in magnificent health up to the night before his fatal attack. Even the morning of that attack he had been well. He had gotten up, made his own coffee, gotten his newspaper from the front door and gone back to bed to read and then write to his wife. At this point, the aorta snapped. Within an hour and a half he underwent open heart surgery, but the tear was too great - his bodily organs refused to function and while the great heart mheld out for four days, Giovanni Martinelli never regained consciousness. His life was music - and he was life personified. On Wednesday November 20th, 1963 at 8.00p.m. 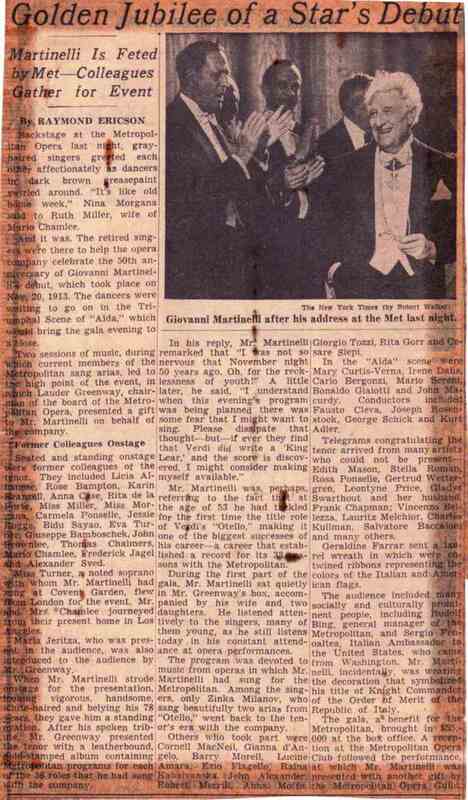 The Metropolitan Opera held a gala performance in honour of Giovanni Martinelli, 50 years after he first appeared there. 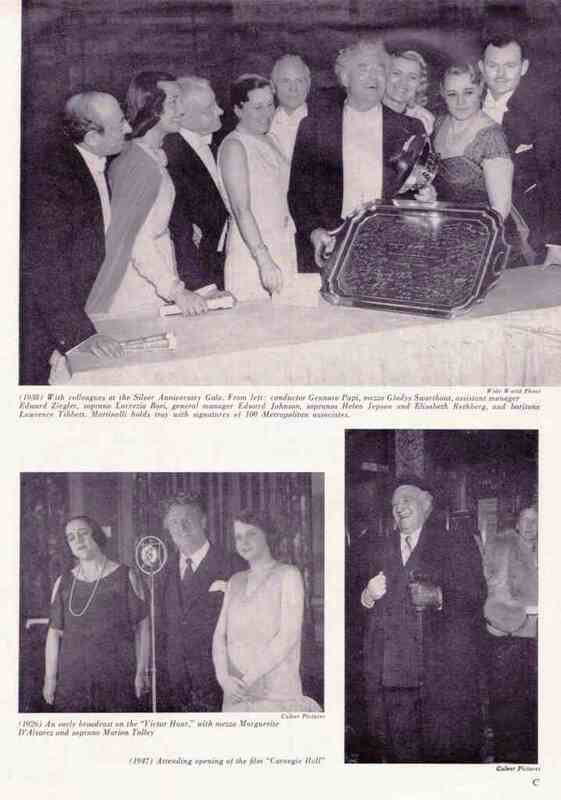 Here are some scans of the program from that event and some reviews of the same.